The portable version of EssentialPIM can be run directly from a USB drive so you can take your appointments, tasks and notes with you when you travel. All of your settings are stored on the USB providing a consistent user experience no matter which computer you are using the software on. All of the data you work with is encrypted and remain only on the USB drive so there is no danger of leaving personal information on someone else's machine - however, it is possible to configure folders on your home computer which can then be used for backup purposes and storing temporary files. Two version of the portable edition of EssentialPIM are available Free and Pro. 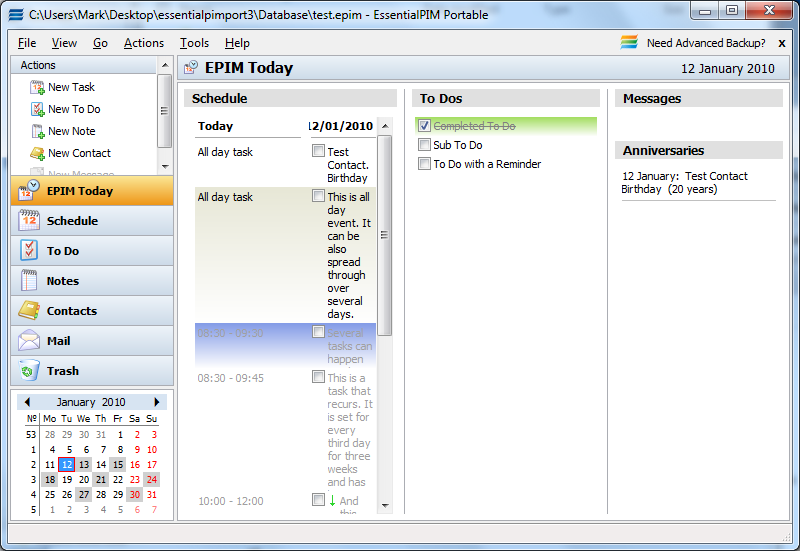 The Pro version adds the ability to automatically run the program when the USB drive it is stored on is connected to computer and *.epim files can be automatically associated with Portable EssentialPIM. With the Pro edition, you can create shortcuts to Portable EPIM from within the program on any computer. If you find that you regularly work with more than one computer, working with portable provides a quick and easy way to ensure that you have access to the same information wherever you may be, and you do not need to compromise on features. What's new in 8.15 (see the full changelog for more)?